Commentary by Jerry West, Austin Carr, Larry Bird, Wayne Federman, Steve Alford, Bill Walton, and others. Commentator: Pete was a showman. He played the game with a tremendous flair. 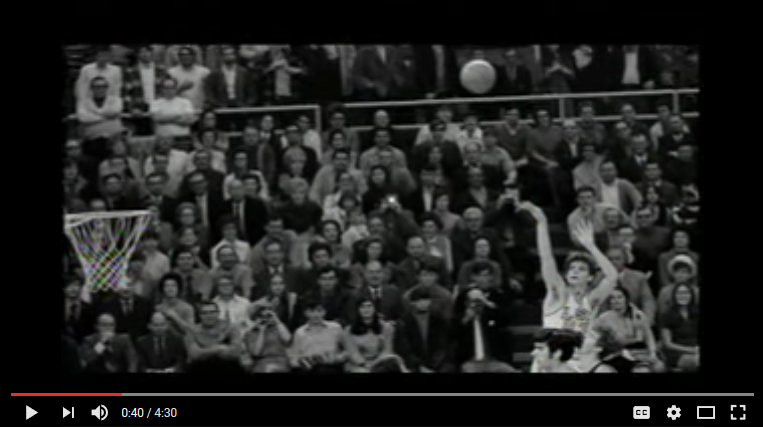 Man: Pete Maravich was so far ahead of his time. He was ten plays ahead of everyone else. Man: Boy, he’d make you look foolish out there if you didn’t know what you were doing. Man: The legendary following that Pete Maravich has is the truest testament to how great he was because this was a guy who made SEC basketball what it is. Man: LSU was 3 and 20 the year before he joined the varsity. And suddenly he was drawing people all over the place. It was like a phenomenon, almost like an Elvis Presley kind of situation where people would just go in droves to see this kid and what they called “showtime” which surrounded him. 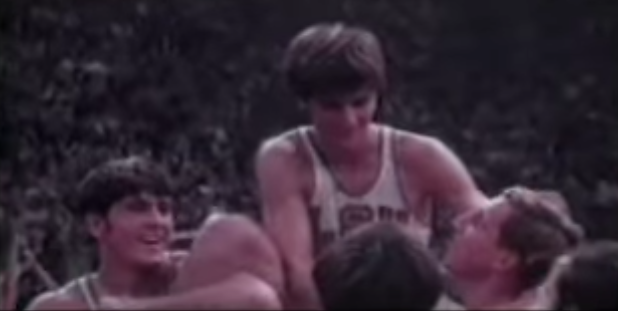 Man: Press Maravich decided he was going to create the perfect basketball machine and he came awfully close. He’s consumed with strategy, tactics, the psychology of basketball. 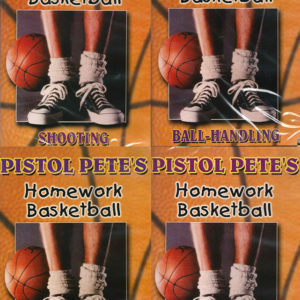 Everything he sees goes in to the hopper and what comes out is Pistol Pete. He decides early on that he is going to give his son to the game. Man: Press wanted Pete to be the show and there were times when there were questions about whether or not that was the best way to go. 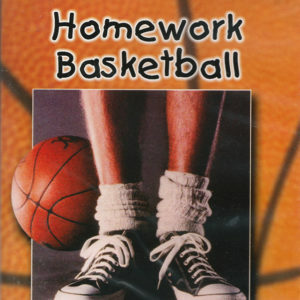 Man: In bed at night, take the ball, and just repeat his shooting motion over and over again and say, “Fingertip control, backspin, follow through.” Over and over and over, just so he would get a perfect rotation on the ball. Man: The wrist passes, the fake behind the back, the way he would fake passes that the entire world would react to, and then he’d pull it back and stroke the shot. Man: Man, he was a showman. He could handle the ball. He could shoot the ball at different angles. 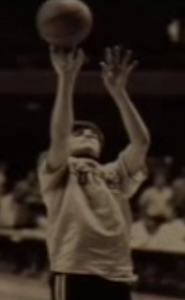 I mean he could flip the ball with his left hand over here and it’d hit the board and, shoom, right in the basket. I mean he was just uncanny. Man: Pete was sort of creating not only great basketball, but great theater as well. Only two players have led the NCAA in scoring for three consecutive years and that’s Oscar Robertson and Pete Maravich. Man: The game in 1970, where he breaks Oscar Robertson’s record, is really anticipated as the crowning achievement in the career of both father and son. Man: What’s astonishing is that we’re 30-plus years past Pistol’s career and no one since has been able to approximate what he was able to do. Man: Now they’ve added 10 to 12, 15 more games per year and nobody is ever going to come remotely close to his records. What a touch. 44 points per game. Man: To give you an idea of how good that is, second place is Austin Carr, Notre Dame, at 34.6. Maravich just blew away the field. Man: As flamboyant as any player I’ve ever seen with a basketball, and an entertainer. Maybe the best entertainer our game’s ever seen. Man: I guess it just shows he was a prodigy. He was a sensation. I guess there’s never been another Mozart. There’s never been another John Lennon or Elvis. So maybe that’s what it is. Maybe there will never be another Pistol because there just can’t be.